The point of this article is to show exactly what performance to expect from any of these exhausts if they are bolted onto a standard Runner/Dragster 180. 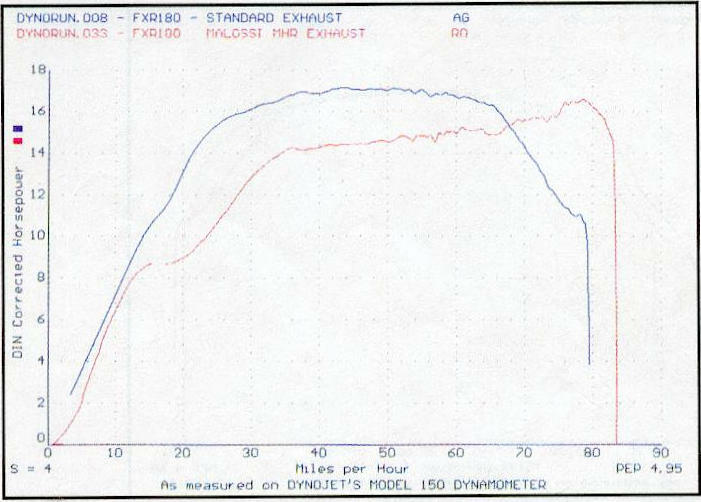 These results are largely irrelevant once you get involved in tuning and fitting kits, because the higher revving exhausts may then be better suited to the engine's characteristics, In all the subsequent graphs, the standard exhaust is represented by the blue curve and the compared exhaust is shown by the red curve. 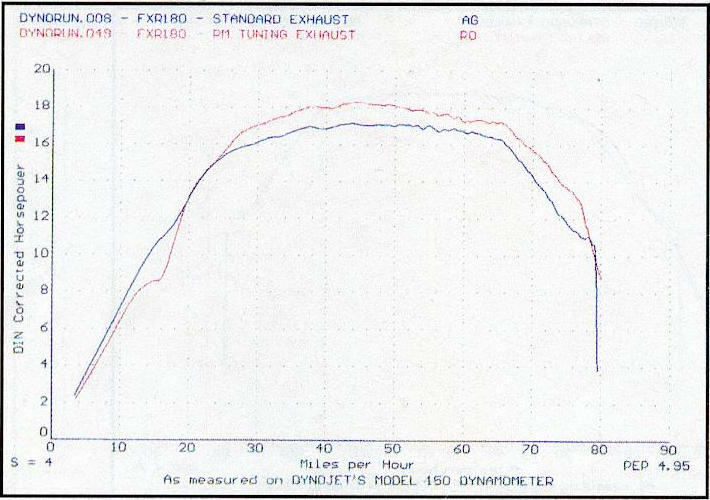 On a standard 180 Runner /Dragster, only the PM and Stoffi pipes provide a worthwhile performance improvement. Considering that we have tested samples from the cream of Europe's tuning houses , then this really does go to show how far the development of original equipment silencers has come in the last few years and particularly how fussy the 180 Runner engines is to pipes. and to the detriment ofthe life of your engine since it is having to run at higher rpm all of the time. If you just want something cheap to replace a broken original pipe - and arent worried about loosing 1.3 hp - then the best bet from this bunch appears to be the Kundo for �0. As for all the others, then the simple answer is mot to waste your money if you are simply looking for a simple boost to a standard scooter, because they will all make it perform worse in some way. 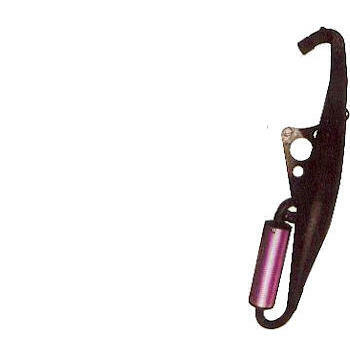 We also planned to include the Gianelli Freeway exhaust for the 180 Runner in this test, but the current batch for this model turned out to have been recalled by the distributor. 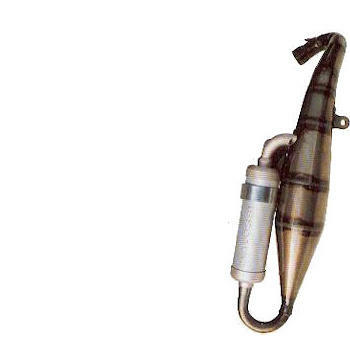 There are also some systems wich we may hopefully manage to try if all the manufacturers and distributors are willing to play ball: the Kegra Racing exhaust, Sito Plus, and a bit of luck, a brand nea PM 55 Mk2 Whatch out for a part two soon. which is still slightly down on the original. exhaust is very expensive, at �5. but	the gain was all across the	speed range. pipe for a re-test next issue.